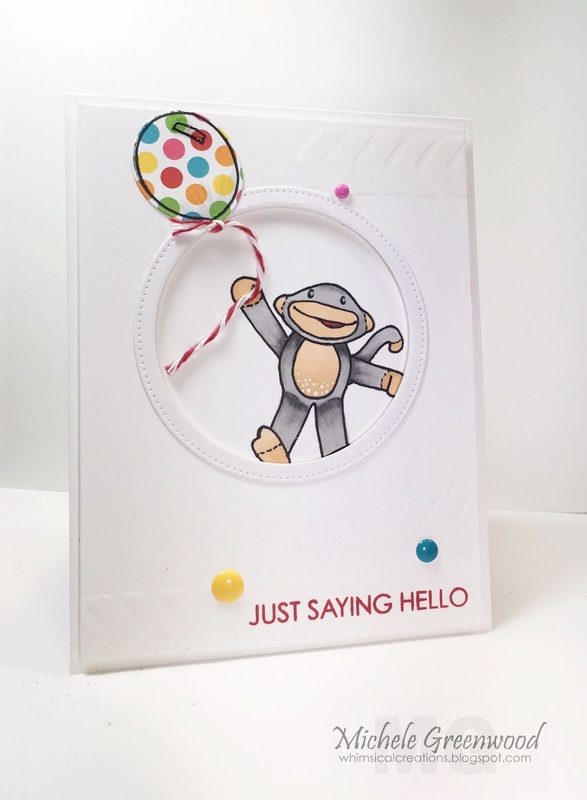 Hi friends – welcome back for another collab post from Hero Arts and Ellen Hutson! Seriously – this sock monkey!!! Did you have one growing up? I know we did and they are just adorable. 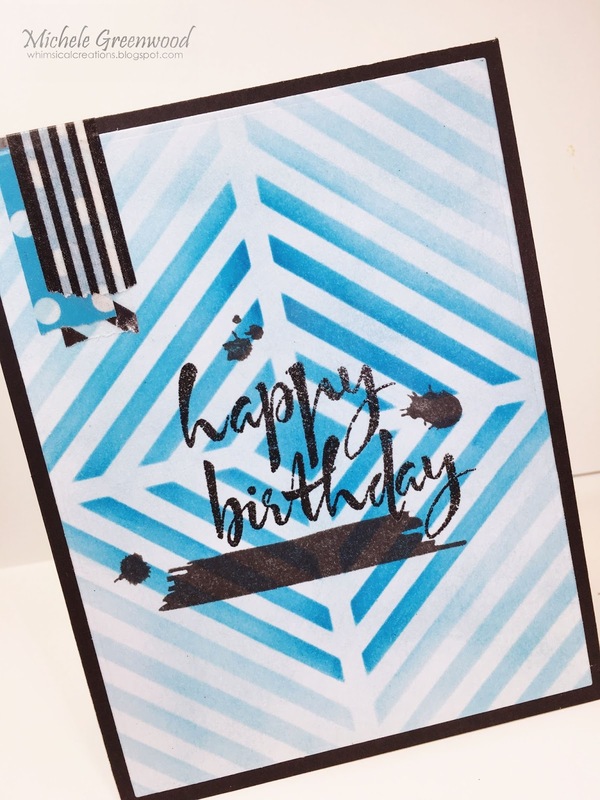 I had a ton of fun making this card, it’s very simple…and I even got some subtle, very subtle, texture going on! I stamped the image on the front of the card and colored with Copics, I also outlined it with a sharpie as I didn’t get the best impression. 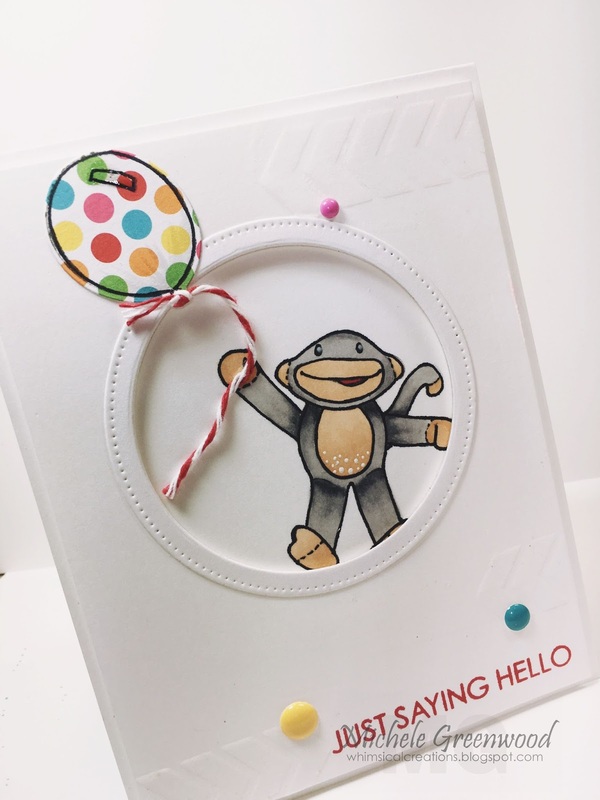 I cut an additional piece of white card stock and added a circle and circle border to allow the monkey to peek through. I stamped the balloon on designer paper and adhered it to the very top panel which was added using foam dimensional adhesive tape. 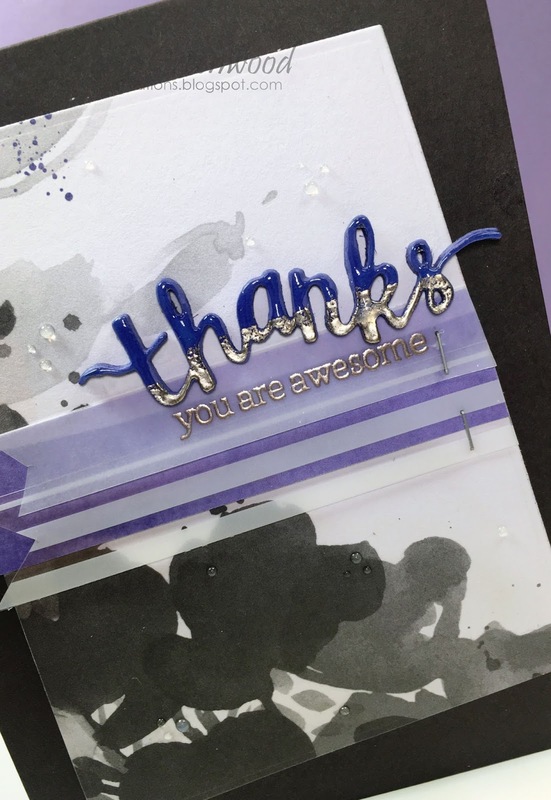 I added a Hero Arts sentiment to the bottom of the main panel, then embellished with a Hero Arts stencil and matte transparent embossing paste – such a subtle hint of texture. Final touch was the fun red and white twine and enamel dots! Thanks for stopping by; we can wait to see YOUR creations using TEXTURE; link ’em up HERE for your chance to win! Hero Arts – THANKS, you are awesome! Hi friends, welcome back to another fun Pop of Color card; have you joined in the fun this month? You can link up your creations HERE. I used a piece of designer paper that was mainly black, white and gray with some super small dots of purple at the very top – voila, purple became my pop! 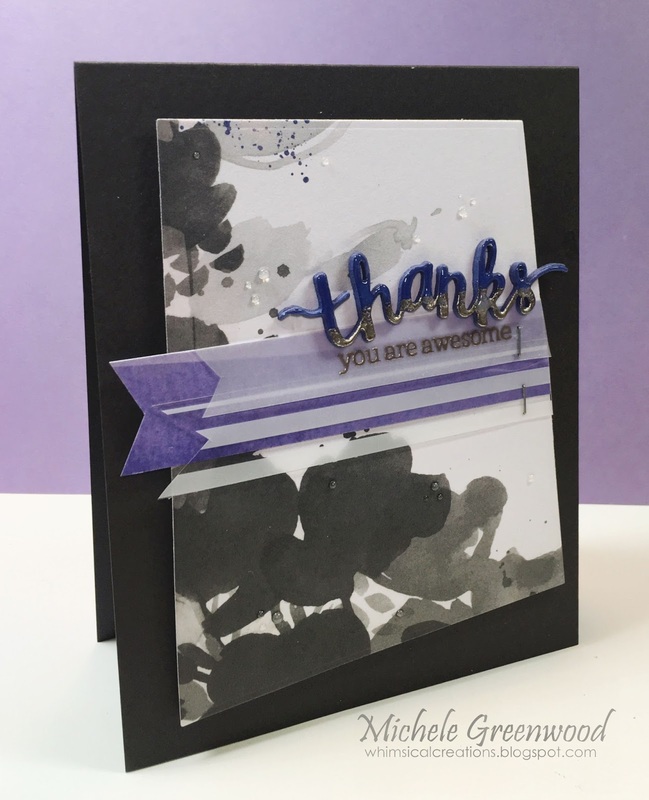 I die cut the ‘thanks’ sentiment multiple times from purple paper then dabbed on some VersaMark and added platinum embossing powder. I then stamped the sentiment ‘you are awesome’ in VersaMark on vellum and embossed with the same embossing powder. 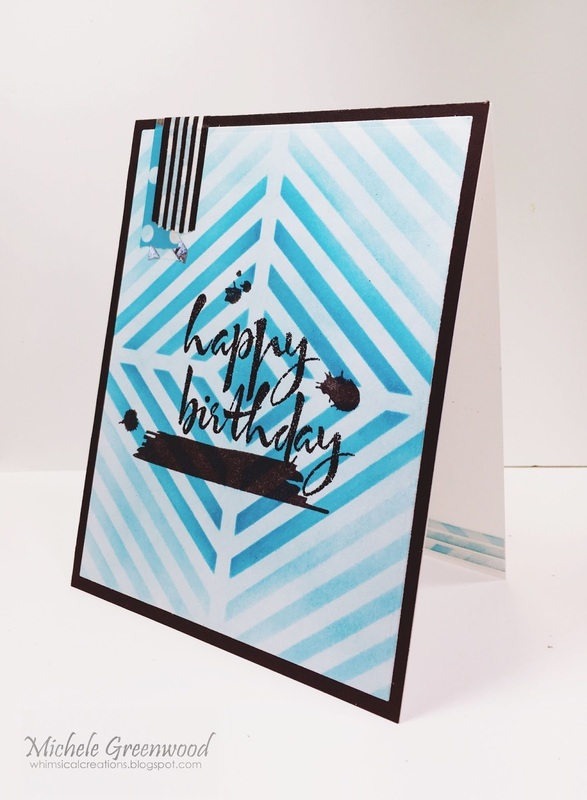 I added a strip of leftover ombre paper and some white striped acetate paper, all adhered with my tiny attacher (first time ever used – yep, truth)!! 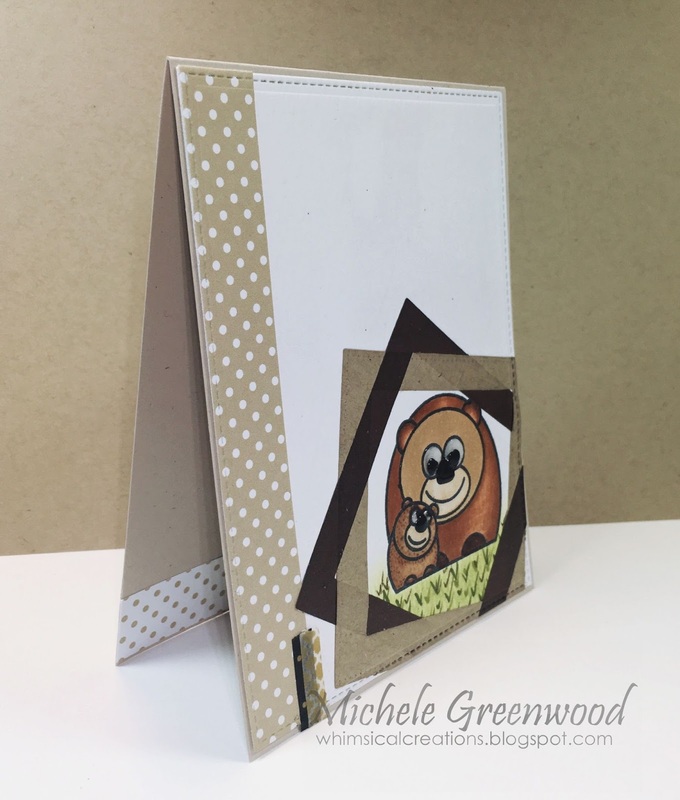 I finished the card with some glossy accents over the die cut as well as a few scattered throughout the card. Thanks for stopping by; don’t forget to link up your creations HERE! AND be sure to stop by and visit our sponsor, The Ton! Hi friends – welcome back for another fun pop of color inspiration piece. This month we are partnering with The Ton – WOW, WOW, WOW – such gorgeous stamps, matching dies and gorgeous sequins/beads – be sure to check them out! 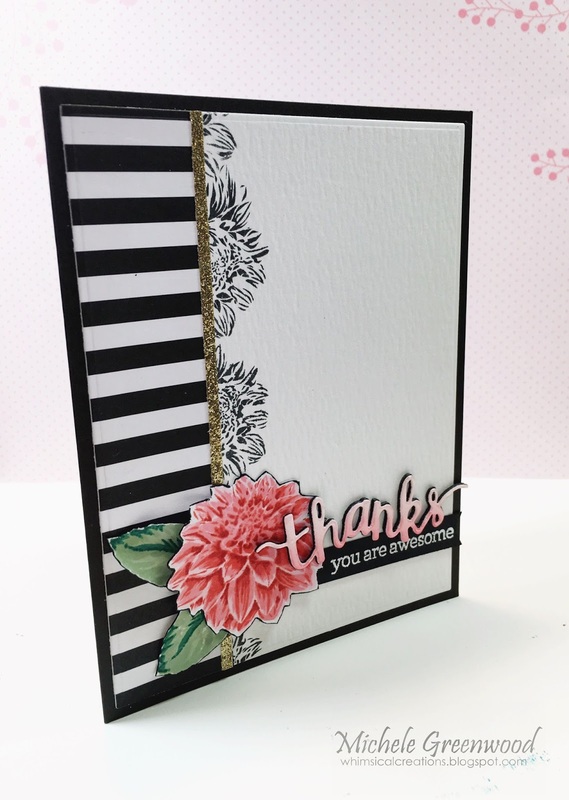 I knew I wanted to go graphic as well as clean and simple (CAS); so I stamped what would be the third stamp in the layering flower down the left hand side of the card; I then added some graphic black and white paper from my hoard stash. 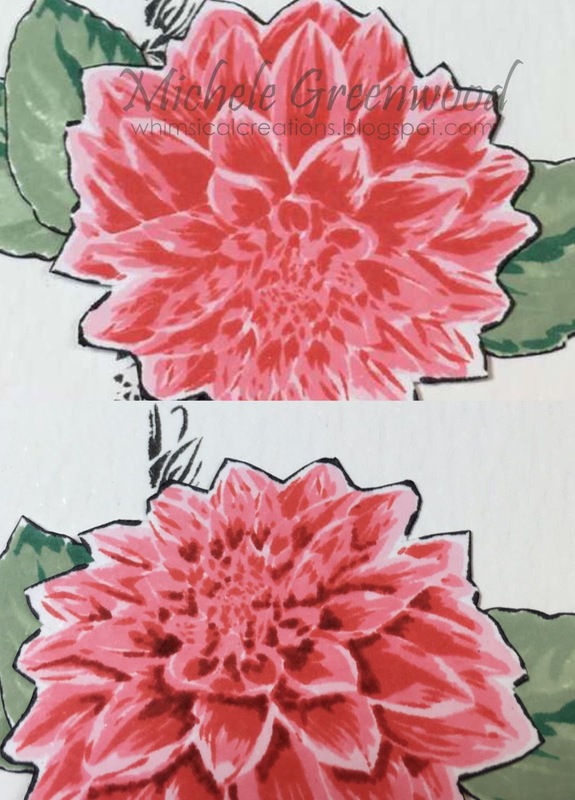 I stamped all 3 images from one of the floral layering sets on Hero Arts white layering paper with Worn Lipstick and Barn Door distress inks. That in itself is pretty, but look what happens when I added some shadows with a Barn Door distress marker – now the depth really pops! I stamped several leaves but only used two; sometimes I stamped 2nd generation, sometimes I stamped full strength on full strength of the same color for a deeper/richer color. I don’t have the matching dies so just cut each piece out and colored the edges with a black marker for a defined edge. I die cut the ‘thanks’ from pink and black card stock and layered them up – I added some sponging to the pink layer for a fun ombre look, finished it off with glossy accents, clear wink of stella and layered all the pieces on to the main panel which was adhered to a Hero Arts black note card (white on the inside). Thanks for stopping by; hope you take some time to play along with our pop of color challenge this month, another great prize up for grabs! Hi friends – welcome back to another masculine card for this months challenge featuring Hero Arts products! Have you taken the time to enter our challenge; if not, you still have time, link ’em up HERE! 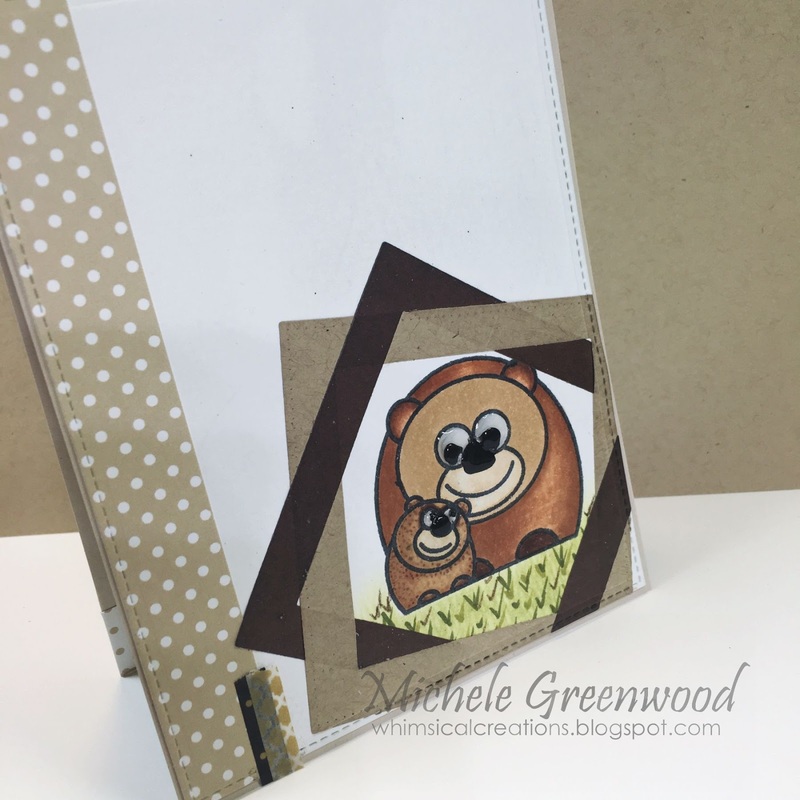 I adore this Lil Hoot stamp set and thought using the bears would be perfect for sending hugs to a ‘younger’ individual. A very CAS card! I colored the bears with Copics after stamping in Hero Arts intense black ink; added a couple frames using MFT’s pierced square dies and some polka dot paper down the left side. Thanks for stopping by; hope you’ll join our masculine challenge this month!! Hi friends – welcome back for another fun masculine card – this time a birthday card for someone extra special in my life – MY HUBBY! Anyway, back to hubby and I – our birthdays are only 5 days apart (with several years included) – HA!! I took a piece of Hero Arts snow white layering paper and sponged on Tumbled Glass distress ink; then taped down the Hero Arts window pane stencil and added Mermaid Lagoon focusing mainly on the middle section but then adding more light sponging towards the edges. 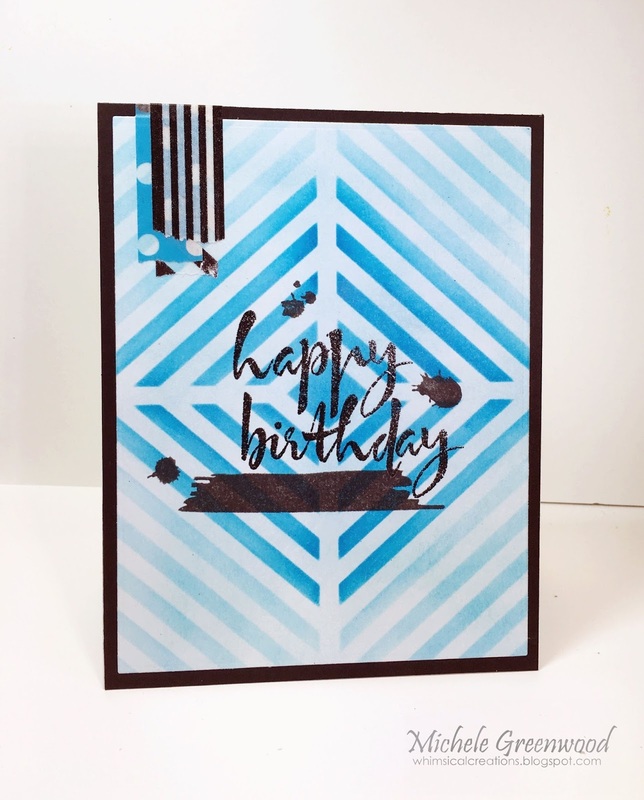 I stamped the happy birthday in VersaMark and embossed with black super fine powder, the other images were stamped with Hero Arts Intense Black. I cut the main panel with a large rectangle die, then cut the remaining pieces into small strips and added to the inside of the card. 😀 Use ALL those scraps. Thanks for stopping by; hope you’ll join our MASCULINE challenge this month; we love seeing your creations!